What does it mean to “Dare-2-Be-Great”? Is there a science behind it? Is it subjective? There may not be a definitive answer to any of the aforementioned questions… but one thing’s for sure… you know it when you see it. Fighter’s come from many different backgrounds, offer different styles and carry a different story. They all fight for different reasons and have different goals. Inspiration varies just as much as a boxer’s choosing of fight night attire. Some want to be loved, some want to be villainous while some could care less what you think about them. The one aspect all fighters share is the courage to step inside the squared circle and offer up their livelihood for our entertainment. Daring to be great isn’t mandatory for a fighter. Many prize-fighters have had prosperous careers that generated a healthy living and provided entertaining bouts without daring to be great. That doesn’t take away from their courage by any means. D2BG is a choice. It’s what’s made boxing the apex of all sporting events. D2BG takes our imagination beyond its limits, because we cannot comprehend such guts. It’s Roberto Duran moving up in weight after dominating the lightweight division, only to challenge America’s golden boy Sugar Ray Leonard. Why? Because he could not fathom any one in their right mind believing he was not the best fighter in the world. Duran fought with a controlled rage that constantly motivated him to D2BG. He continued to move up in weight, fighting Wilfred Benitez at Light Middleweight and giving Marvelous Marvin Hagler all he could handle for the Middleweight Championship. Even in defeat, Duran was the epitome of D2BG. He fought the best of his era, being the only one between himself, Hagler and Hearns to defeat Leonard. Hagler fought with a chip on his shoulder and wanted nothing more than to fight the best to prove he was the best. He chased a fight with Sugar Ray Leonard to prove once and for all that he was the best middleweight in the world. Golovkin has stated many times the he will move up in weight to fight the best. He will move down in weight to fight the best… and he wants to unify his current division. This man dares to be great. D2BG isn’t a fighting style… it’s an approach. You don’t have to slug it out every bout or completely eliminate the sweet science of boxing out of your repertoire. Muhammed Ali dared to be great and fought every great heavyweight of his era. He wasn’t a slugger… or a brawler… he was an artist who painted pictures inside the ropes. An amazing boxer whose mission was to show the world he was “The Greatest”. It’s an approach… an attitude… a methodology that of a warrior. To leave no doubt in anyone’s mind that when it’s all said and done, I proved that I was the best by none other than beating the best. Oscar De La Hoya dared to be great… fighting the best fighters of the previous era [Chavez & Whittaker], his current era [Quartey, Trinidad, Mosley, Hopkins] and the future era [Mayweather Jr. & Pacquiao]. After Felix Trinidad’s controversial defeat of Oscar De La Hoya, he dared to be great by moving up in weight and completing the “Gold Medal Trilogy”… defeating David Reid and Fernando Vargas. Then he moved up again to middleweight, destroying William Joppy only to be dethroned on his brilliant run by another D2BG affiliate Bernard Hopkins. Manny Pacquiao has always dared to be great. The 8-Division world champion fought the very best in every division he moved up to besides Floyd Mayweather Jr., but has publicly campaigned for the bout on many occasions. Names like Barrera, Morales, Marquez, De La Hoya, Hatton, Cotto, Margarito, Clottey, Mosley and Bradley highlight a heavy resume solidifying Manny’s D2BG status. Just as the regeneration of boxing continues… so does the fraternity of D2BG fighters. While Golovkin vies for claim as the best fighter in the world, another D2BG member in Canelo Alvarez could stand in his way. 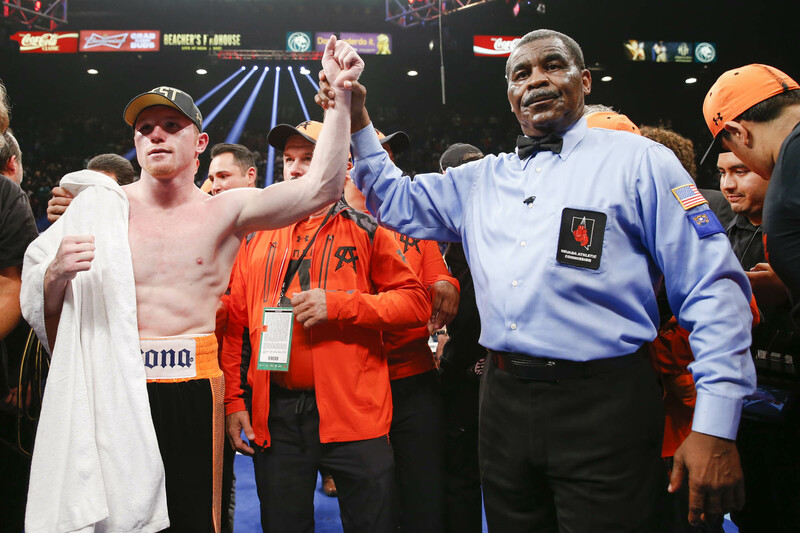 Canelo has publicly gone on record as stating he wants a fight with Golovkin after his clash with Miguel Cotto. He dares to be great and while not many would give Canelo a chance against the pulverizing punching of Golovkin, one must respect his willingness to engage in the battle. A pure testament to Canelo’s D2BG status is his desire to fight anybody regardless of risk, style or proper matchmaking. There’s no better example than his acceptance of a bout with Erislandy Lara, a slick defensive boxer that possessed a style known to give Canelo fits. There was no incentive in the Lara fight besides daring to be great. He walked away a victor in controversial fashion, but no one can take away the fact that he wanted to prove he was the best by beating the best. That’s daring to be great… pushing yourself beyond limits. Taking chances. Eliminating the thought of risk with a keen focus on the reward. Accepting the mere possibility of defeat with the aspiration of immortality. It’s not about what makes sense… or who’s the biggest draw… or what bout provides the path with least resistance. D2BG is about heart… determination… legacy. Not every boxer who dared to be great is a legend in the sport… but in order to be classified as a legend in my book, you have to D2BG.